At the end of December, I did a 2017 favorites post instead of a monthly favorites. I didn't have a ton of favorites from December, anyway, but there were a few notable ones so I decided to add them to my January favorites instead! When my skin is dry in winter, I prefer hydrating primers to ensure that my makeup doesn't cling to any dry patches that I get. 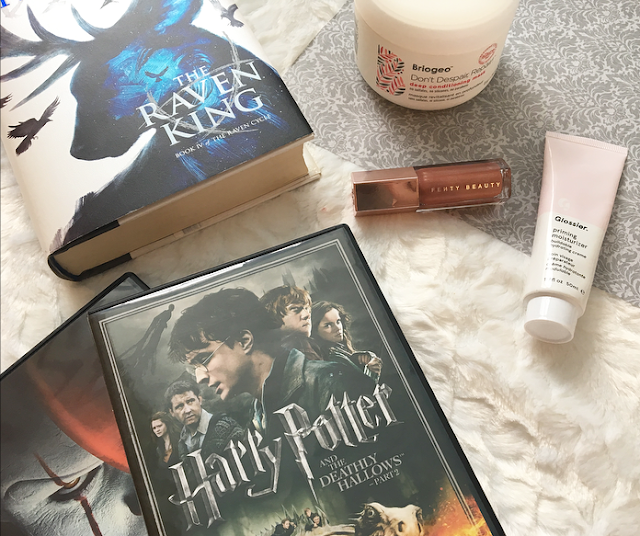 This is the best hydrating primer that I have ever found! It's a light moisturizer that sinks in quickly and leaves my skin smooth and hydrated. Other primers that give glowiness seem to have a lot of shimmer or a metallic finish to them, but this makes my skin look naturally luminous. The past few months I have been on a hunt for the perfect shampoo/conditioner duo. Some are too light for my dry hair, others don't cleanse thoroughly enough...basically, if you have any suggestions, I would love to have them! One product that has not let me down at all is this Briogeo mask. I received it from Influenster in exchange for an honest review and I've loved having the full size to use. I use it once a week and I notice a difference in the softness of my hair for days afterward. When my current shampoo and conditioner run out, I might switch my entire haircare routine to Briogeo. My wallet won't like it, but I think that my hair will. Lipgloss is making a serious comeback, and I couldn't be happier! When Rihanna launched her brand with Kendo, I really wanted to support her but none of her products seemed right for me. This gloss, however, is a universally flattering shade that I really love. On some people it looks more pink, but it's definitely a neutral shade on me. I love the scent and this gloss doesn't feel sticky at all! I know, I know...I include Harry Potter in my favorites list a lot. Usually I'm talking about the books, and this time I'm referring to the movies. Believe it or not, I actually haven't seen the movies very often. I only saw the Half-Blood Prince in theaters, and I hadn't seen it since! Luckily I found the final three movies in a sale on Black Friday and I completed my collection, and then over winter break my sister and I marathoned them all. I interupted every few minutes to add that "in the books they actually..." because I am that sort of person. My sister yelled "Expecto Patronum" at me every day for at least a week after we finished Prisoner of Azkaban. I had a few other TV and movie favorites from the past few months, but I included most of them in my Netflix recommendations post! I saw the It remake in theaters a few months ago and was really impressed with the quality of this horror. I didn't find Pennywise the clown very scary, but the bullies and parents in the movie were genuinely creepy. It was also much funnier than I expected, sometimes in a juvenile way, but overall I loved the movie and I bought it when it came out on DVD. After a rewatch, I think It definitely deserves another spot on my favorites list! Last week I got the urge to reread my all-time favorite series, so guess how I spent my weekend? It's difficult to explain what this series is about, especially because the official synopsis focuses on such a small aspect of it. Officially, the series is about a girl named Blue who is cursed to kill her true love when she kisses him. Unofficially, it is about a group of friends who are searching for a mythical king buried in Virginia. The characters, their arcs, the built-up romance, the beautiful descriptive writing stile...it's a 9.9/10 for me. This is a really cool app that a friend of mine showed me, which is basically a live trivia game...on your phone! There are usually "shows" twice a day and you answer questions for the chance to win money. If you answer all twelve questions correctly, you win the grand prize, which is usually $2000, or you have to split the prize with other people who answer all of the questions correctly. So far I haven't gone past the sixth question, but I'll keep trying and have fun doing it! 14 comments on "December and January Favorites"
The Briogeo hair mask is nice. I also like the Marc Anthony hair masks. My son has been into Harry Potter lately, and I've been wanting to go back and read The Cursed Child again. Let me know what you think of it when you read it, I still can't decide whether I like it or not! The original IT scared the crap out of me when I was young and I hate clowns until today. I do want to watch the remake but will wait till it's out on DvD. The Glossier priming moisturiser is the least hyped Glossier product and I definitely like it the best. It's fab! I definitely need to grab myself that Fenty lipgloss. Everyone seems to swear by it! I really want to try some of the Fenty products, and the Glossier priming moisturizer sounds fab.